1. Take the rosemary leaves from the sprigs and place them on a small baking tray lined with parchment paper. Let them dry out by cooking them at at 100°C for about 1 hour. 2. Transfer them to the mortar and pestle and beat them to obtain a very fine powder. Keep to the side for the moment. Dice pumpkin into small pieces. 3. Peel the shallots, finely chop and fry them in a saucepan with olive oil. 4. When they have become transparent, add the diced pumpkin and sage leaves. 5. Let it cook for a few minutes, stirring, then pour in the hot vegetable stock. Season with salt and pepper and cook for about 30 minutes or until the pumpkin has become tender and it will be possible to blend. 6. Meanwhile prepare the skewers: shell the shrimp leaving only the tail intact and remove the inner filament. 7. Wrap the bacon in the strips of pancetta and place them on a baking sheet lined with parchment paper. Cook in a preheated oven at 180°C for about 10 minutes. 8. 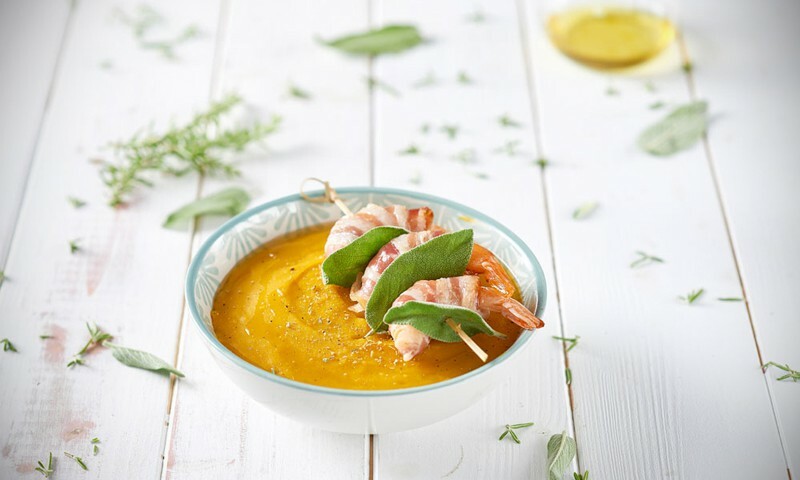 When the pumpkin is tender, remove the sage leaves and blend with the immersion blender until a smooth cream is obtained, possibly correcting the consistency by adding in more stock if necessary. 9. 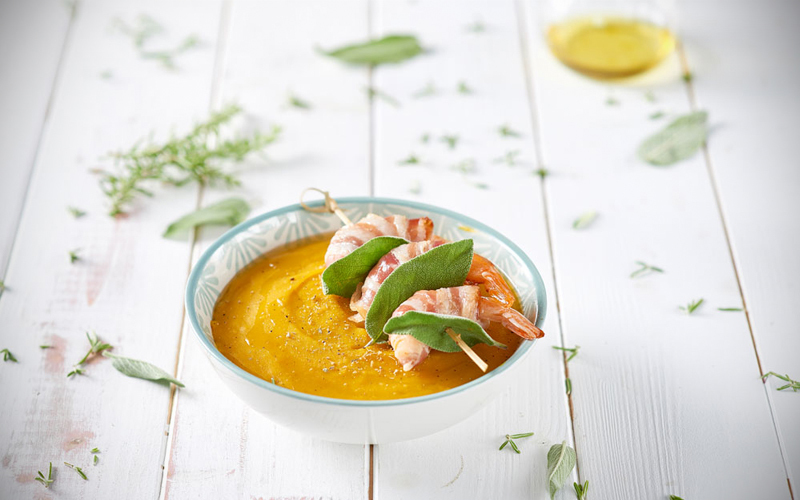 Pour the warm creamed pumpkin in serving dishes along with the prawn skewers and complete with rosemary powder as a garnish.